Presented by SCCC, the Sing.Lang Concert showcases the Singapore connection to the hits and superstars of the Chinese music world. Come join us as we discover the original roots of our music and celebrate the unique and precious brand of Singapore Chinese music that has been enriched with the diverse cultural waters that shaped this island. 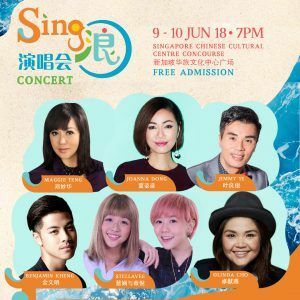 The line-up of Sing.Lang Concert will feature Joanna Dong, Olinda Cho, Maggie Teng, Jimmy Ye, Benjamin Kheng, Stella Vee and more! - This is a standing event. - There will be food and drink stalls on-site that accept cash only. - Union Street and Marina View will be closed for the event. Parking is unavailable at Singapore Chinese Cultural Centre. Please be advised to park at carparks located nearby if you are driving.